"My mind, my body, my home, or whatever I have in my possession I surrender unto Your lotus feet, O my dear Lord, son of Nanda Maharaja. In good or bad fortune, in life or at death, there is no other duty than taking shelter of Your lotus feet. Now if you like You can kill me, or if You like You can give me protection. Whatever You like You can do. I am Your eternal servitor. You have every right to deal with me in any way You please. If I must be reborn, let that birth, by Your desire, be in the home of a devotee. Let that birth be mine. Even a worm's life I'll live as Your servant, but a nondevotee Brahma's lifetime I'll never accept. If one has no aspiration for enjoyment or liberation, I simply hanker for his association. Fathers, mothers, daughters, sons -- all there may be -- master, preceptor, husband, You are all in all to me. Bhaktivinoda says: 'O Krsna, do hear. 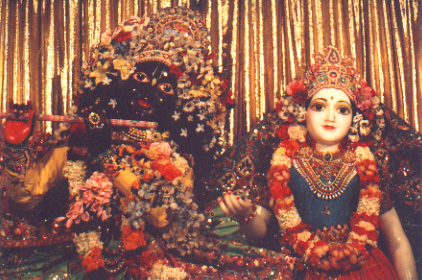 Lord of Srimati Radharani, You are my life dear.'"